Background: It has been long recognized that periodontal diseases are infections of the periodontium, comprising the bacterial etiology, an immune response, and tissue destruction. Treatment strategies aiming primarily at suppressing or eliminating specific periodontal pathogens include adjunct use of local and systemic antibiotics as part of nonsurgical periodontal therapy. Unwanted side effects and resistance of microorganisms toward antibiotics due to their widespread use have modified the general perception about their efficacy. Research in phytosciences has revealed various medicinal plants offering a new choice of optional antimicrobial therapy. Cymbopogon citratus, Stapf. (lemongrass) is a popular medicinal plant. At a concentration ≤2%, lemongrass essential oil inhibits the growth of several kinds of microorganisms including periodontal pathogens, especially the reference strains Actinomyces naeslundii and Porphyromonas gingivalis, which were resistant to tetracycline hydrochloride. Aims: To evaluate the efficacy of locally delivered 2% lemongrass essential oil in gel form as an adjunct to scaling and root planing, as compared to scaling and root planing alone for the treatment of chronic periodontitis. Materials and Methods: 2% Lemongrass essential oil gel was prepared and placed in moderate to deep periodontal pockets after scaling and root planing. 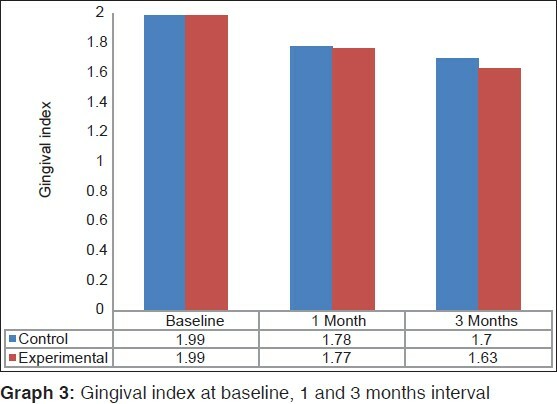 Results: Statistically significant reduction in probing depth and gingival index and gain in relative attachment level were noted in the experimental group as compared to the control group at 1 and 3 months. Conclusion: Locally delivered 2% lemongrass essential oil gel offers a new choice of safe and effective adjunct to scaling and root planing in periodontal therapy. In the present study, an attempt was made to compare the efficacy of locally delivered 2% lemongrass essential oil gel as an adjunct to SRP and SRP alone in the treatment of patients with chronic periodontitis with moderate to deep periodontal pockets. A total of 60 sites were selected randomly from 15 subjects with moderate to severe chronic periodontitis in the age group of 18-55 years (mean age 43.9 ± 5.4 years) who reported to the outpatient Department of Periodontics, P. M. N. M. Dental College and Hospital at Bagalkot. The exclusion criteria for the patients were: (1) regular use of mouthwash/other chemical plaque control agents; (2) tobacco users in any form, alcohol use; (3) patients with systemic diseases like diabetes mellitus or with other diseases which compromise the immune system and are known to influence the periodontal disease; (4) patients having oral hard and soft tissue diseases except caries and periodontitis; (5) chronic use of antimicrobial, ant-inflammatory drugs and medication within 3 months prior to the study; (6) patients who had undergone periodontal therapy within 6 months prior to the study; and (7) pregnant females and lactating mothers. Systemically healthy subjects having at least four isolated periodontal pockets with a probing depth between 5 and 8 mm were included in the study. All potential participants were explained about the need and design of the study. Only those subjects who agreed to participate were enrolled in the study after obtaining their written informed consent. 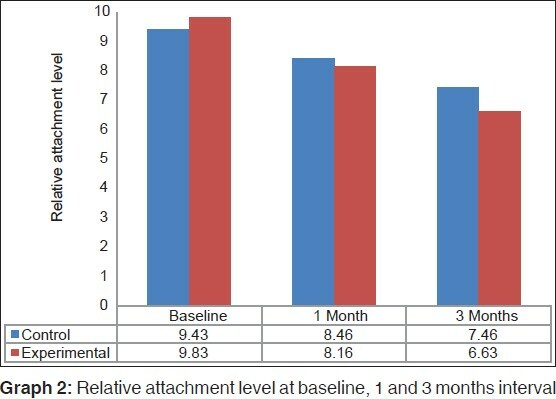 Clinical parameters including gingival index (GI), probing depth (PD), and relative attachment level (RAL) were recorded at baseline (before SRP) [Figure 1] and at 1 and 3 months interval. A custom-made acrylic stent and a William's periodontal probe was used to standardize the measurement of PD and RAL. RAL was calculated by measuring the distance from the stent (apical extent) to the base of the pocket. A single clinician provided treatment to both groups, and all pre- and post-treatment clinical parameters were recorded by another examiner who was masked to the type of treatment received by subjects. The gel was administered by means of a syringe with a bent, blunt-end needle. The needle was carefully inserted into the periodontal pocket and the gel was applied in the test sites in a gentle probing manner, attempting to fill the full extent of the pocket. The gel was applied up to the gingival margin and the excess gel was removed with a sterile gauze. 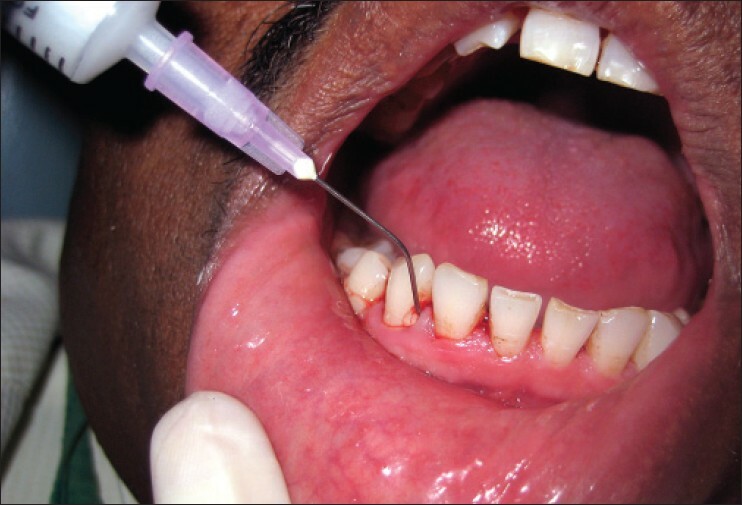 No periodontal dressing was applied after delivery of the drug [Figure 2]. 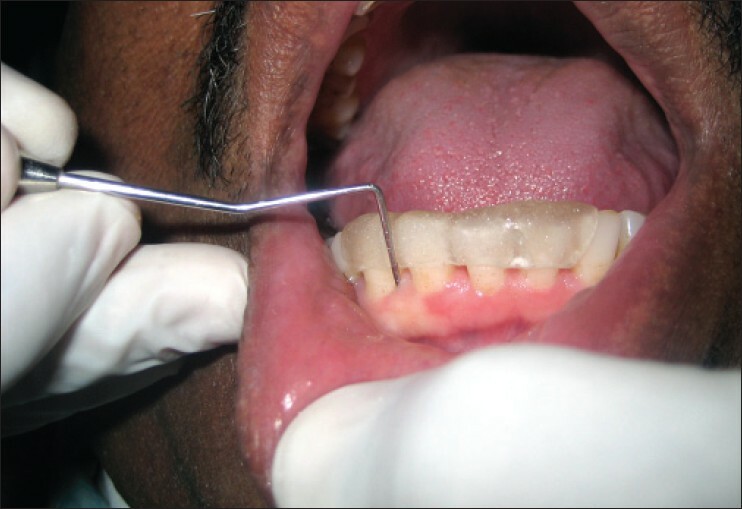 After placement of the gel in situ, patients were instructed to follow strict oral hygiene protocol but were discouraged from using any interdental cleaning aids for 1 week. They were also asked not to chew hard or sticky foods at the gel placement sites. Patients' oral hygiene status was reassessed at 1 week interval. All patients were recalled for follow-up measurements at 1 and 3 months intervals. Statistical analysis of the data was performed by using Statistical Package for the Social Sciences (SPSS) software 16. Student's paired t-test was used to test the mean changes in scores at different time points within each study group. One-way analysis of variance (ANOVA) was used to compare the mean scores between different study groups. Tukey's "honestly significant difference" procedure was used to identify the significant groups, if the test of significance in one-way ANOVA was significant. P < 0.05 was considered as the level of significance in this study. The mean PD in the control group at baseline was 6.33 ± 0.95 mm, after 1 month was 5.66 ± 1.12 mm, and after 3 months was 4.93 ± 0.90 mm. Mean reduction in PD in the control group from baseline at 1 month was 0.66 ± 0.67 mm and at 3 months interval was 1.40 ± 0.75 mm, which was statistically significant [Table 1] and [Graph 1] [Additional file 1]. In the experimental group, the mean PD was 6.60 ± 0.81 mm at baseline and 5.17 ± 0.79 mm and 4.20 ± 0.71 mm after 1 and 3 months respectively. Mean PD reduction was 1.43 ± 0.67 mm and 2.40 ± 0.73 mm at 1 and 3 months, respectively, which was statistically significant. There was more statistically significant PD reduction in the experimental group than in the control group at 1 and 3 months [Table 1], [Graph 1]. Statistically significant reduction in PD and gain in RAL were noted in the experimental group as compared to the control group at 1 and 3 months. In the control group, the mean GI was 1.99 ± 0.76 mm at baseline, 1.78 ± 0.61 mm after 1 month, and 1.70 ± 0.40 mm after 3 months. The mean difference in GI in the control group between baseline and 1 month values was statistically nonsignificant (0.21 ± 0.64 mm), and at 3 months, it was 0.29 ± 0.44 mm, which was statistically significant. In the experimental group, the mean GI was 1.99 ± 0.61 mm at baseline and 1.77 ± 0.65 mm and 1.63 ± 0.75 mm after 1 and 3 months, respectively. Mean reduction in GI was 0.22 ± 0.61 and 0.34 ± 0.38 mm at 1 and 3 months, respectively. At 3 months, the mean GI reduction was statistically significant. There was statistically significant reduction in GI in the experimental group and control group from baseline, and after 3 months, it was not statistically significant. Although there was statistically significant reduction in GI in the experimental group than in the control group, it was not statistically significant [Table 3], [Graph 3] [Additional file 3]. In the present study, we used 2% lemongrass essential oil in the form of gel as an adjunct to SRP. Statistically significant reduction in PD and gain in RAL were seen in the experimental group as compared to the control group at 1 and 3 months [Figure 1], [Figure 3], and [Figure 4]. Also, there was increased reduction of GI in the experimental group than in the control group, though it was statistically nonsignificant [Figure 5]. Overall, the improved clinical resolution of inflammation and destruction seen in the experimental group can be explained by the effectiveness of lemongrass essential oil gel as an anti-inflammatory and antimicrobial agent against periodontal pathogens, which might have prevented microbial recolonization of periodontal pockets. Increased tissue healing response seen in the experimental group can also be explained by the antioxidant activity of lemongrass essential oil gel components, which prevents further periodontal tissue destruction. Results of the present study cannot be directly compared with that of any other study because to the best of our knowledge, it is one of the first studies of its kind, evaluating the effectiveness of 2% lemongrass essential oil gel as a local drug delivery agent. But the findings in the present study are indirectly similar to those of the previous studies, where lemongrass essential oil solution in the form of mouthwash accelerated gingivitis healing process through its antioxidant activity. Carbopol mucoadhesive polymer used in the present study for gel formulation helped to obtain effective 2% concentrations, and also could achieve adequate subgingival delivery of the lemongrass essential oil and sufficient contact time for its antimicrobial activity. However, in the present study, the main outcome of therapy was measured purely based on clinical parameters like PD and GI reduction and gain in RAL. Though acrylic stent was used for standardization of RAL measurements with William's periodontal probe, it has its own limitations. While the effects of 2% lemongrass essential oil gel on subgingival microbiota and its antioxidant activity were not assessed, further studies with large sample size need to be conducted to evaluate its definitive role in periodontal therapy. Further standardization of the gel formulations should be done and their efficacy should be compared with the gold standard local drug delivery therapeutic agents like chlorhexidine. C. citratus (lemongrass) plant is native to South India and has various medicinal properties. Isolation and characterization of phytochemical extract from this plant offers new choice of therapy as an adjunct to mechanical instrumentation in the treatment of chronic periodontitis with moderate to deep periodontal pockets. Within the limitations of the present study, it can be concluded that 2% lemongrass essential oil gel appears to be an attractive alternating agent that can be used for effective and safe local drug delivery as an adjunct to mechanical nonsurgical periodontal therapy. Cymbopogon citratus, Stapf. (lemongrass) is termed as bhūtīkam in The Ayurvedic Formulary of India. Bhūtīkam is mentioned in classical texts like Aṣṭān˙gahṛdayam, Caraka Saṃhitā and Suśruta Saṃhitā. It has been used as an ingredient in many formulations with various combinations in conditions like fever, abdominal complaints, hemorrhoids, pain, etc. It is one of the ingredients in Pañcamūlādi yavāgu which is prescribed for worms, skin diseases and diabetes. In the chapter Anuvāsanottarabasticikitsitā of Suśruta Saṃhitā. Suśruta advocates the use of vasti with bhūtīkam as one of the ingredients for diseases related to vāta in manya and śiras. In jvarapratiṣedhādhyāyaḥ of Suśruta Saṃhitā, a decoction with bhūtīkam and other drugs have been mentioned for throat related disorders. The Bhāvaprakāśa and Kaiyadeva nighaṇṭu-s deal with Bhūtīkam under the titles bhūtṛṇam and bhūstṛṇam respectively. Bhūtīkam, guhyabījam, sugandham, jambukapriyam, bhūtṛṇam, chatrā, mālātṛṇa, etc are its synonyms. The plant is mentioned in Dhanvantari nighaṇṭu and is advised for diseases occurring due to kṛmi (worm infestation). The karma of bhūtīkam comprises of mukha śodhanam/vaktra śodhanam (cleansing of mouth) along with the other actions like dīpanam (carminative), vidāhi (causing burning sensation), netryam (good for the eyes), avṛṣyam (anaphrodisiac), bahuviṭkam (causing formation of excess faeces) and doṣa karmas like pitta rakta pradūṣaṇam. The botanical name of Bhūtīkam as per the translation of Bhāva prakāśa is Andropogan citrarum. The commentators have given the synonyms of bhūtīkam as kattṛṇam (Hemādri, Dalhaṇa), rohiṣam (Hemādri, Dalhaṇa) and yavāni. 1. Haffajee AD, Socransky SS. Microbial etiological agents of destructive periodontal diseases. Periodontol 2000 1994;5:78-111. 2. Schwach-Abdellaoui K, Vivien-Castioni N, Gurny R. Local delivery of antimicrobial agents for the treatment of periodontal disease. Euro J Pharma Biopharm 2000;50:83-99. 3. Slots G, Rams TE. 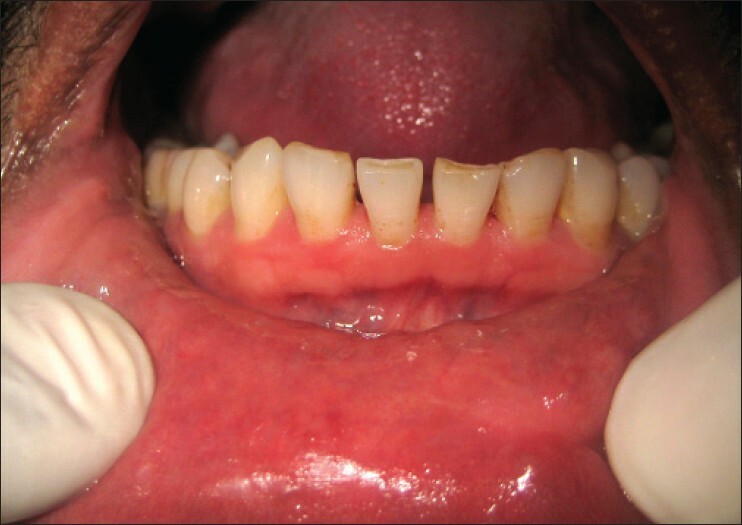 Antibiotics in periodontal therapy: Advantages and disadvantages. J Clin Periodontol 1990;17:479-95. 4. 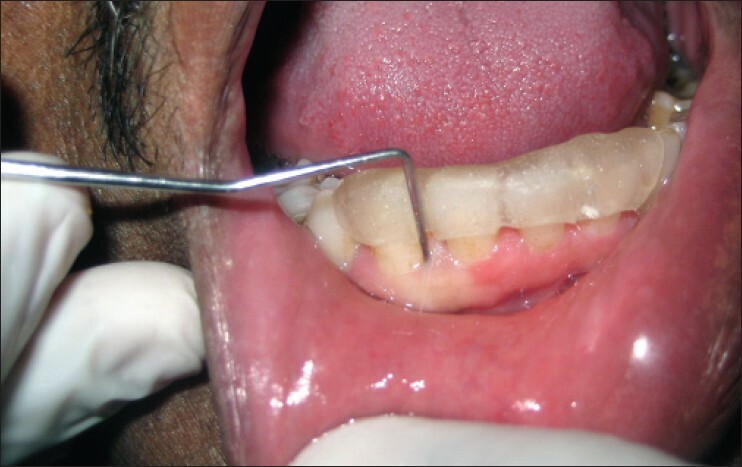 Wolff L, Dahlen G, Aeppli D. Bacteria: As a risk markers for periodontitis. J Periodontol 1994;64:498-510. 5. Listgarten MA. Pathogenesis of periodontitis. J Clin Periodontol 1986;13:418-25. 6. Genco RJ. Antibiotics in the treatment of human periodontal diseases. J Periodontol 1981;52:246-71. 7. 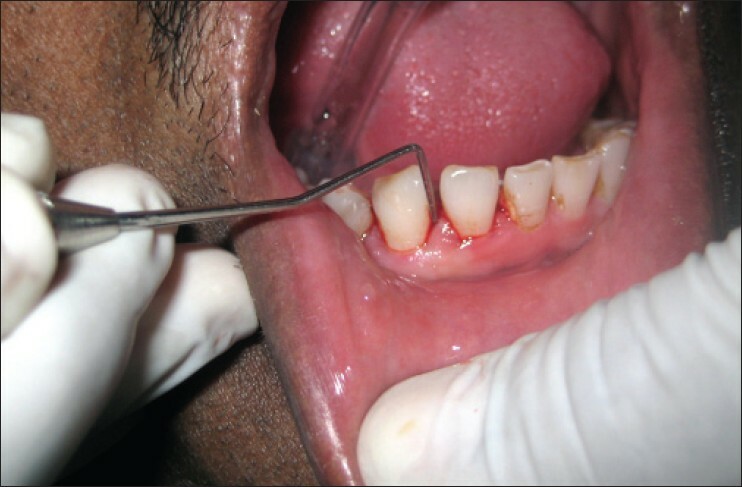 Jaykumar P, Deepalakshmi P, Shankaram V. Local drug delivery using doxycycline hyclate (Microplast) in the treatment of periodontal disease: A Clinical and microbiological evaluation. Int. Journal of Contemporary Dentistry 2011;2:30-6. 8. Palombo EA.Traditional medicinal plant extracts and natural products with activity against oral bacteria: Potential application in the prevention and treatment of oral diseases. Evid Based Complement Alternat Med 2011:1-15. 9. Khan R, Islam B, Akram M, Shakil S, Ahmad A, Manazer SA. Antimicrobial activity of five herbal extracts against multi drug resistant (MDR) starins of bacteria and fungus of clinical origin. Molecules 2009;14:586-97. 10. Shah G, Shri R, Panchal V, Sharma N, Singh B, Mann AS. Scientific basis for the therapeutic use of cymbopogon citratus, Staph (Lemon grass). J Adv Pharm Tech Res 2011;2:3-8. 11. Crawford M, Havson AW, Koker MES. The structure of cymbopogon, a novel treterpenoid from lemongrass. Tetrahedron Lett 1975;35:3099-128. 12. Hammer KA, Carson CF, Riley TV. Antimicrobial activity of essential oils and other plant extracts. J Appl Microbiol 1999;86:985-90. 13. Khongkhunthian S, Sookkhee S, Okonogi S. Antimicrobial activities against periodontopathogens of essential oil from lemon grass (Cymbopogon citratus (DC.) Stapf CMU. J Nat Sci 2009;8:11-21. 14. Susanto SA, Oktavianti TA, Wijaya Y, Wira V, Paramitta VA. Increased glutathione level in saliva of moderate gingivitis patients after lemongrass (cymbopogon citratus) essential oil gargling. Asia Pac Dent Stud J 2010;1:45-52. 15. Anand KM, Goyal R, Bhat SGGS, Kamath S, Anand KM, Aggarwal M, et al. A novel anti-oxidant lemon grass oil mouthwash- a clinical trial. Asian J Exp Biol Sci 2011;2:482-6. 16. Medlicott NJ, Rathbone MJ, Tucker IG, Holborow DW. Delivery systems for the administration of drugs to the periodontal pocket. Adv Drug Deliv Rev 1994;13:181-203. 17. Bruschi ML, Jones DS, Panzeri H, Gremiao MP, Freitas OD, Lara EH. Semisolid systems containing propolis for the treatment of periodontal disease: In vitro release kinetics, syringeability, rheological, textural and mucoadhesive properties. J Pharm Sci 2007;96:2074-89. 18. Lynch SE. Methods for evaluation of regenerative procedures. J Periodontol 1967;38:610-6. 19. Patel J, Patel B, Banwait H, Parmar K, Patel M. Formulation and evaluation of topical aceclofenac gel using different gelling agent. Int J Drug Dev Res 2011;3:156-64. 20. Hanes PJ, Purvis JP. Local anti-infective therapy: Pharmacological agents. A systematic review. Ann Periodontol 2003;8:79-94. 21. Kukreja BJ, Dodwad V. Herbal mouthwashes-A gift of nature. Int J Pharm and Bio Sci 2012;3:46-52. 22. Desai A, Anil M, Debnath S. A clinical trial to evaluate the effects of triphala as a mouthwash in comparison with chlorhexidine in chronic generalized periodontitis patient IJDA Archives. 2010;2:243-7. 23. Reddy PD, Satyanarayana T, Swarna LD, Purushothaman M. Local drug delivery of herbs for treatment of periodontitis. Journal of Innovative trends in Pharmaceutical Sciences 2010;1:245-51. 24. Vagbhata, Ashtanga Hridaya, Kalpa Siddhi Sthana, 3/14. Edited by Bhisagacharya Harisastri Paradakara Vaidya. 9 th ed. Varanasi: Chaukhambha Orientalia; 2002; 750. 25. Susruta, Susruta Samhita, Cikitsa Sthana, 37/19. Edited by Vaidya Jadavji Trikamji Acharya. 4 th ed. Varanasi: Chaukhambha Orientalia; 1980; 532. 26. Susruta, Susruta Samhita, Uttaratantram, 39/193. Edited by Vaidya Jadavji Trikamji Acharya. 4 th ed. Varanasi: Chaukhambha Orientalia; 1980; 686. 27. Dr. Jharakhande Ojha, Dr. Umapathi Misra, editor. Dhanvantari nighantu. Varanasi. ChaukhambhaSurabharathi Prakashan; 1996; p.172. 28. Viswanathdvivedi Sastri, editor. Bhavaprakash nighantu. Varanasi. Motilal Bhanarasidas; 1998. p. 212-213. 29. Acharya Priyavrat Sharma, Dr. Guru Prasad Sharma, editor. Kaiyadeva nighantu. Varanasi. Chaukhambha Orientalia; 1979; p.231. 30. Viswanathdvivedi Sastri, editor. Bhavaprakash nighantu. Varanasi. Motilal Bhanarasidas; 1998. p. 212-213.